North America Canada and the United States. This is a fascinating 1848 full color edition of the S.D.U.K. map of the United States including part of Canada. The map covers the United States east of the Mississippi as well as the Trans-Mississippi territories of Louisiana, Arkansas and Missouri. Several Indian tribes are identified, including the Chippeways, Sioux, Foxes, and others. Wisconsin and Iowa are shown with amorphous boundaries. Most of what is today Wisconsin is identified as 'Northwest Territory.' The map also includes profiles of 5 canals in the lower right quadrant and the United States census of 1830 listing the free and slave population according to states. This ephemeral map details United States during a period of rapid development and westward expansion. 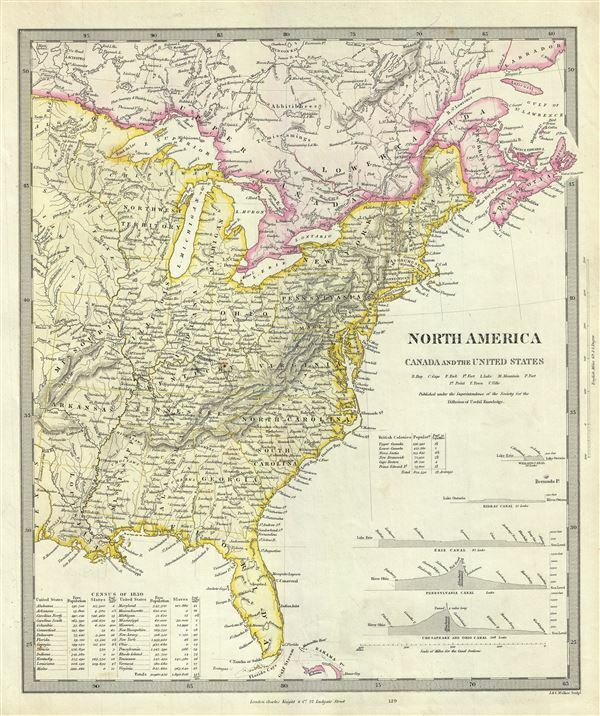 Throughout the 1840s emigration and settlement to the west of the Mississippi led to a transformation of the national map. The present example focuses on the eastern portion of the country in the early days of the Mexican-American War. Texas, in 1846, joined the Union leading to U.S. invasion of Mexican California and the subsequent events of the Mexican-American War. Rumsey 0890.127 (1834 edition). Phillips (Atlases) 794.